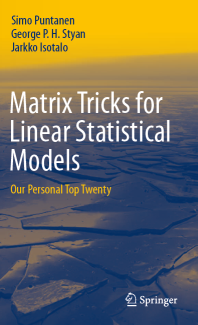 Matrix Tricks for Linear Statistical Models: Our Personal Top Twenty, Authors' website of the Tricks, webmaster Kimmo Vehkalahti. 2011. Springer's website of the Tricks. 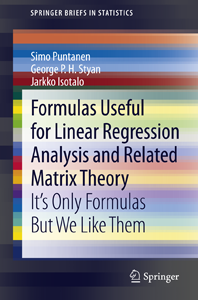 Formulas Useful for Linear Regression Analysis and Related Matrix Theory: It's Only Formulas But We Like Them. Preface and TOC, 2013. Matriiseja tilastotieteilijälle, 2. painos. Informaatiotieteiden yksikkö, raportti 56/2017, Tampereen yliopisto. ISBN 978-952-03-0535-2, ISSN 1799-8158. 378 pp. Download PDF, Esipuhe, sisällysluettelo, lähteet. TamPub website. International Statistical Review, Short Book Reviews, Editor, 2007-2013. Videos from the conferences in statistics in Tampere in 1987 and 1990. Website for the IWMS series | IWMS - short history: Updated PDF.